The geometry App opens up new ways to discover "dynamically" geometric relationships. 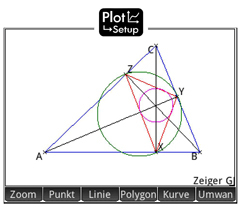 For this, the application provides all the features of popular dynamic geometry systems and allows you to draw points, segments, lines, polygons, and different curves (circle, ellipse, hyperbola, parabola, etc.). Also can easily midpoints, intersections, angle bisector, tangent, perpendicular, etc. be constructed. In addition, measurement and zoom functions are available. Like any dynamic geometry software also provides the geometry App dynamic tensile mode, the comfortable through the use of multi-touch technology can be performed in all directions with a finger movement.